Take ciabatta and cut it into pieces as like small squares. Take all the pieces into a pan now spread olive oil, salt, now bake it for more than 5 minutes. Take a new small pot and mix ricotta, lemon juice, lemon zest, garlic, rosemary, salt, pepper it will mixed look like white color mixed. Now take chicken and spread salt, pepper on it very well now again mix with chicken that white mixing that you already make before finally spread olive oil on that chickens. And now bake the chicken that already mixed with all the things spelled above more 20 minutes. Now add tomato, lemon juice, vinegar and first small pieces of ciabatta together. 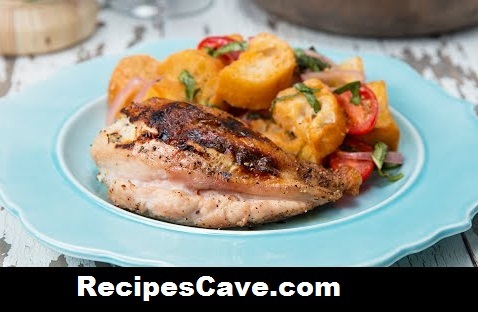 Now keep the chickens on this things now finally your chicken breast with tomato panzanella is ready to taste.